We are a husband and wife team who share running the practice with bringing up our two boys. 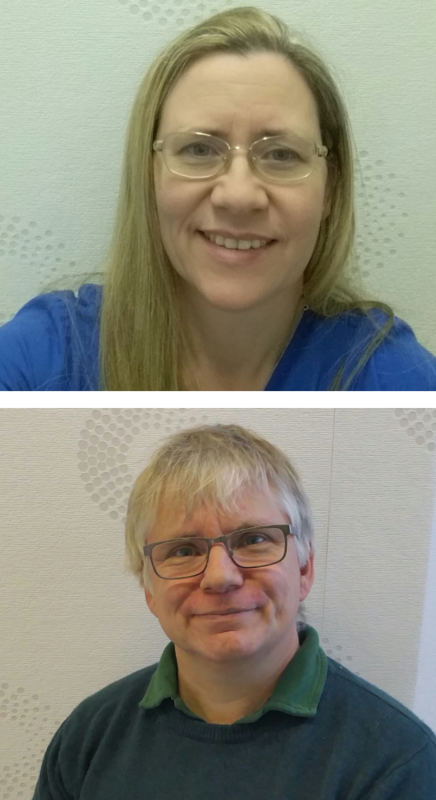 Susan works in clinic daily Monday to Friday with Theo assisting in a less clinical way. He still works in conjuction with Susan for nail surgery and with any complex cases we see in clinic as is necessary, plus deals with much of the background running of the clinic itself. Theo is Carlisle born and brought up, moving to Edinburgh in the late 80's. He attended Queen Margaret University College to do his professional training for the Diploma in Podiatric Medicine and subsequently the B.Sc. in Podiatry, where he met Susan training in the same class year. Susan originates from Fife, Scotland but has called Cumbria home since 1995 moving into the region to take up NHS posts, before taking over the Fisher Street practice in 2002 with Theo. The practice has been running in excess of 40 years, with Theo and Susan at the helm for the past fifteen years since taking over the practice from Miss Lisa Goble, who had stepped into the shoes of the founding practitioner, Mr Kelly in the late 1980's. There are a number of patients who have been with the practice since Mr Kelly's days, attending for their routine foot care and foot health maintenance. We are happy to see all ages and issues linked to foot health and foot care - our youngest patient started attending when she was just over 2, and our eldest lived past her 100th birthday.